It’s no secret I love pizza. I mean, the ratio of pizza to any other type of recipe on YTGT – very healthy. Think, Taco Pizza, Naan Pizza and Pizza Toast. But, just when you thought I couldn’t up my pizza game any further. This happened. OMMGEEEEEEEEE guys. These are delicious. 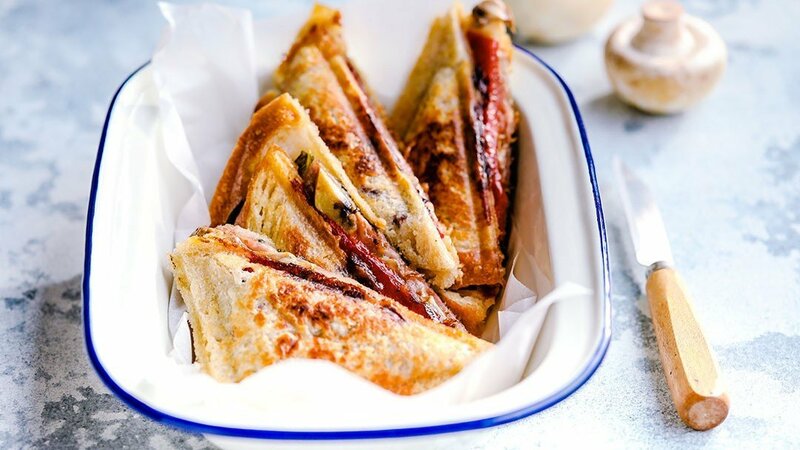 There is something about all those pizza flavours, being trapped between two slices bread, that makes pizza jaffles something really amazing. I know it’s a big call. But maybe even tastier than regular pizza? Really!!!! I can vouch for combos, involving salami-ham-olives-mushrooms-spinach-capsicum and cheese. But seriously, stuff your jaffles with cheese and anything remotely pizza related and I think you’ll be like – Wow Oh Wow. You don’t need an actual jaffle maker. A regular sandwich press will give you the same delicious-pizza flavours all squidged together- effect. Crammed with fresh veggies = healthier than regular pizza. Crazy easy dinner, in less than 15 minutes. 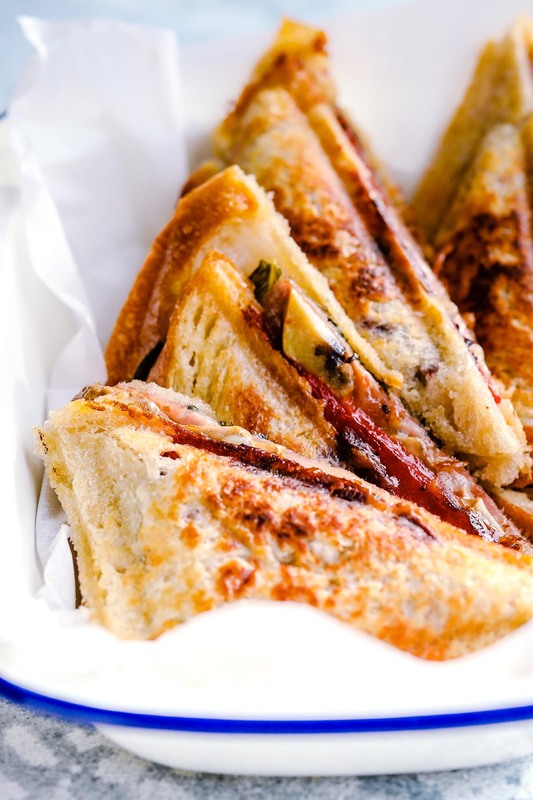 Pizza jaffles WILL make you happy. Findings derived from personal experience. Okay. 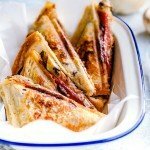 I think we have established that pizza jaffles are flavour bombs AND you must put them on your meal plan next week. Let me know what fillings you use. I love talking pizza. Think classic pizza toppings like salami, mushrooms, capsicum, olives and cheese trapped between two slices of crispy, buttery bread. Warning: by the time you’ve finished your first pizza jaffle, you’ll be planning the next one. Preheat your jaffle maker or sandwich press. Lightly butter the bread on one side and thinly slice the mushrooms. Set aside. Place 2 slices of bread butter side down on a flat surface. Top with spinach, salami. mushrooms, roasted capsicum, olives and mozzarella cheese. Place the remaining 2 slices of bread on top of the fillings, butter side up. Cook in the jaffle maker for 8 minutes or until the jaffles are golden. Trim any uncooked edges and serve each jaffle with a side of mixed leaves. Warning: your jaffles will be so choc-full of goodies that your machine may not shut. The strategy. Squeeze the lid down as far as it will go (being careful the top slice of bread doesn’t slip exposing your fillings), cook for a few minutes, then squeeze the lid down again. By the second go, the veggies will have softened enough, for you to close the lid down all the way. 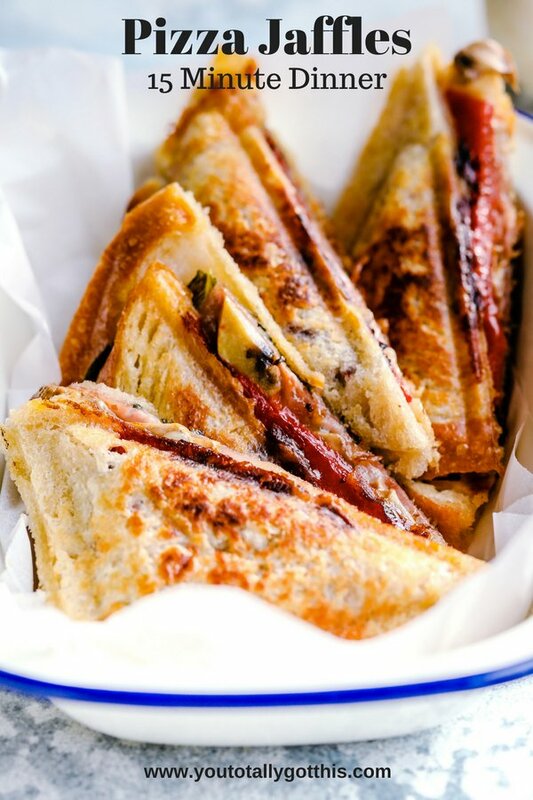 P.S – Want a whole weeks worth of dinners just like this awesome Pizza Jaffles Recipe? Grab your FREE quick and easy weeknight dinner plan right here. Oh yum, this absolutely looks delicious. I wanna give this a try! Thank you so much Pat. They are so delicioius and super easy. Really appreciate you checking out YTGT.